Red, white and blue flags fly on Patriotic cards from CardsDirect to reflect thanks and appreciation for friends, clients, business associates and all proud Americans. Send a business appreciation to those whose partnerships you value or to family and friends, thanking them all year long with a show of patriotism and pride in our country. CardsDirect LLC (http://www.cardsdirect.com ), an online leader in customizable, printed business greeting and holiday cards announces its line of Patriotic greeting cards perfect for the upcoming forth of July holiday and all through the year. As a show of business appreciation, Patriotic cards let clients and business associates know that their partnerships are valued and their support appreciated in an effort to promote American business. As the card pictured here says, "The friendship of those we serve is the foundation for our progress." A card of appreciation with a patriotic theme brands a company as one that is interested in America and proud of their products, services and business partners. In this election year, patriotism is in the forefront on a daily basis. 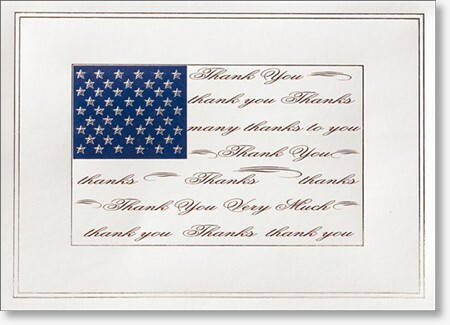 For 2008, CardsDirect is proud to release a variety of Patriotic Thank You cards, including several exclusive designs. Thank you is conveyed in American flag waving red, white and blue! Suitable for businesses and consumers alike, all can be custom printed to include verse and personalization for a thank you greeting that spreads patriotism and U.S. pride. "I am extremely proud to be offering American made products of the highest quality. The introduction of new designs to our selection of patriotic cards is a great way to show American support and pride in our country," says Marine Corporal John Vogel, Merchandising Manager at CardsDirect. CardsDirect is also pleased to be able to announce design work is in progress on many new Holiday Patriotic cards for the upcoming Christmas and holiday season. In addition to its line of Patriotic cards, CardsDirect offers one of the best card selections in the market for other holidays and special occasions, including an inventory of more than 2,000 cards to choose from with various themes. Founded in 1998, CardsDirect LLC is a catalog and internet-based social expression company headquartered in Plano, Texas that has grown into one of the most trusted online resources for custom imprinted card products. Whether it is 25 cards or 25,000+ cards, CardsDirect gives all orders the personal attention deserved. CardsDirect offers custom greeting cards for consumers and businesses including Christmas cards, holiday cards (Thanksgiving, Hanukkah, New Years, etc.) photo cards, thank you cards, anniversary cards and assortment packs for all occasions. Nine out of ten Fortune 500 companies order cards from CardsDirect annually due to an easy ordering process, value pricing, and top notch customer service. CardsDirect has been recognized eight years running as a distinguished dealer and has won numerous awards from industry leaders and manufacturers. The CardsDirect team is always working hard to provide a positive, easy and enjoyable card buying experience.